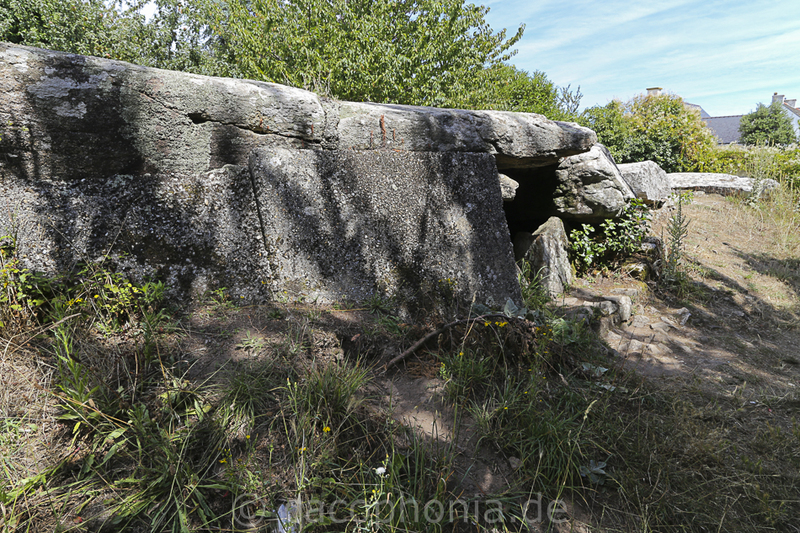 This dolmen is situated about 300m from the Table des Marchand. It is also known as Mané Rutual or Men Er Rutual and dated at about 3800 BC. 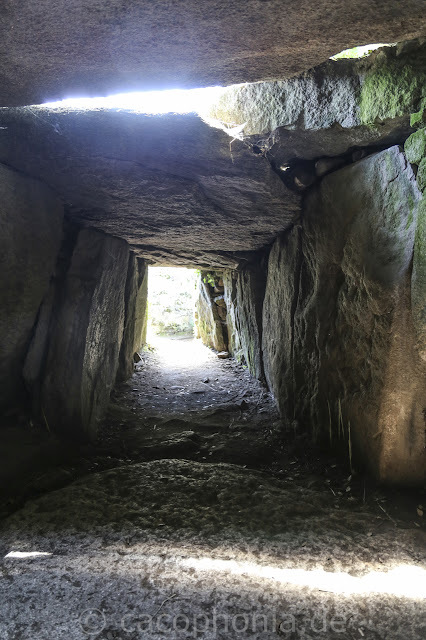 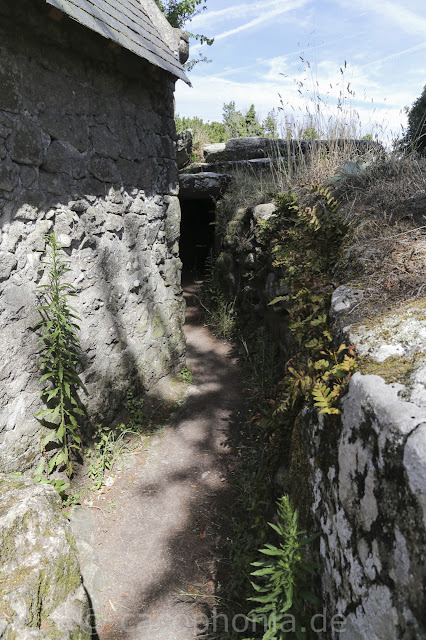 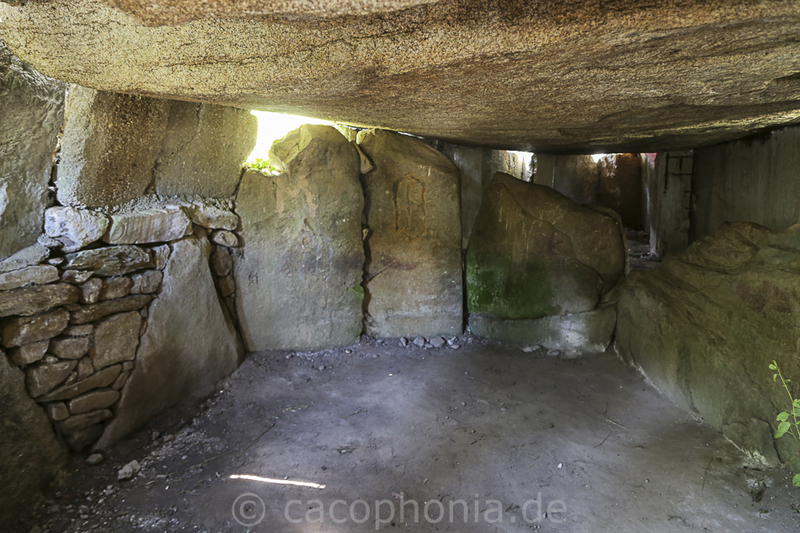 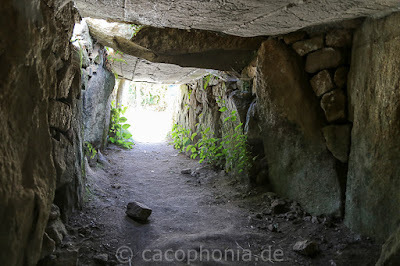 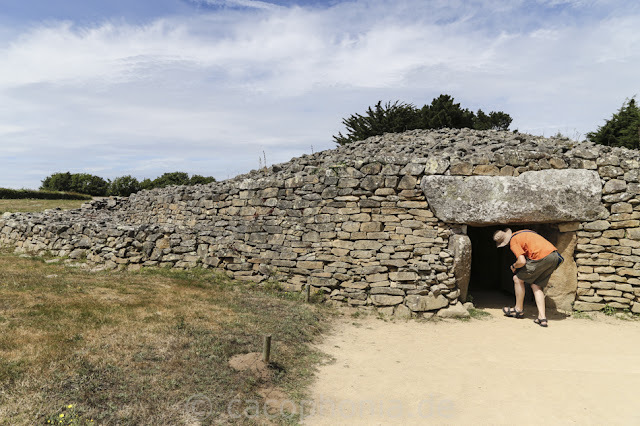 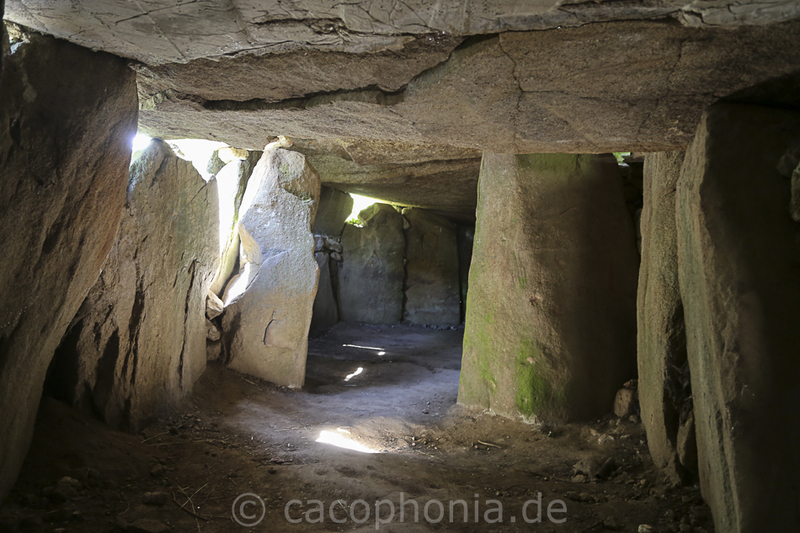 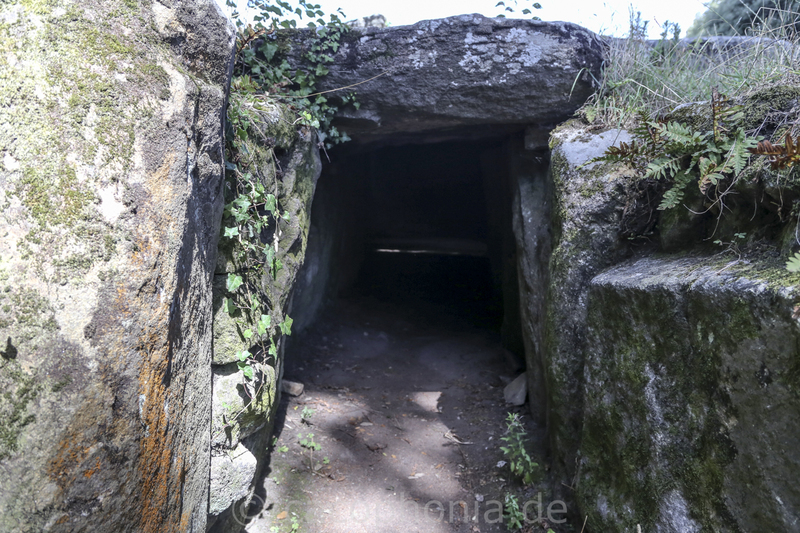 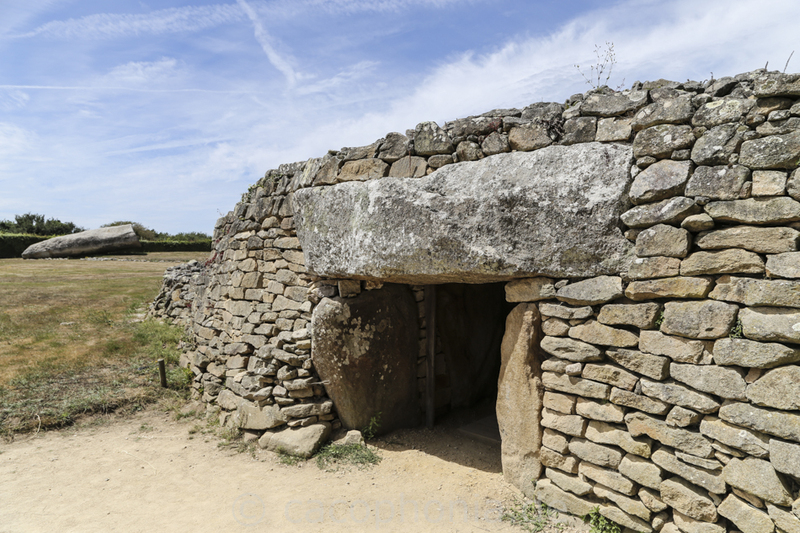 With its length of 20m it is the longest passage grave in Brittany (passage 9,50m, prechamber 6,50m, main chamber 5m). 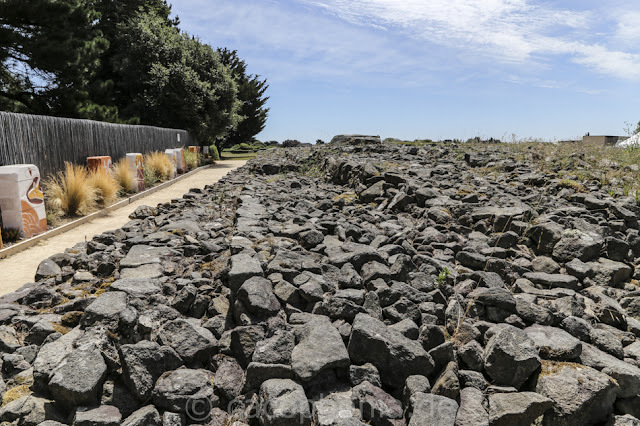 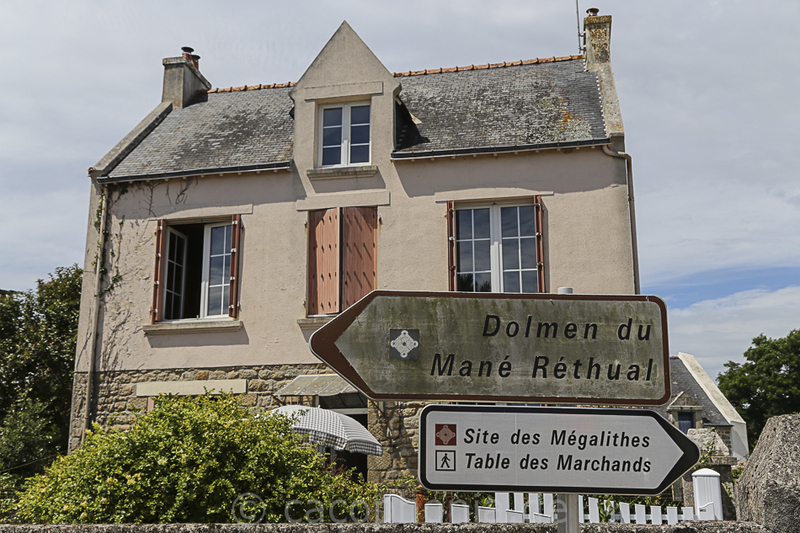 Most of the stones consist of local granit but the broken topstone is from orthogneiss from Auray (10 km away). In former times the dolmen was covered by stones as a tumulus and by sand and plants, too. 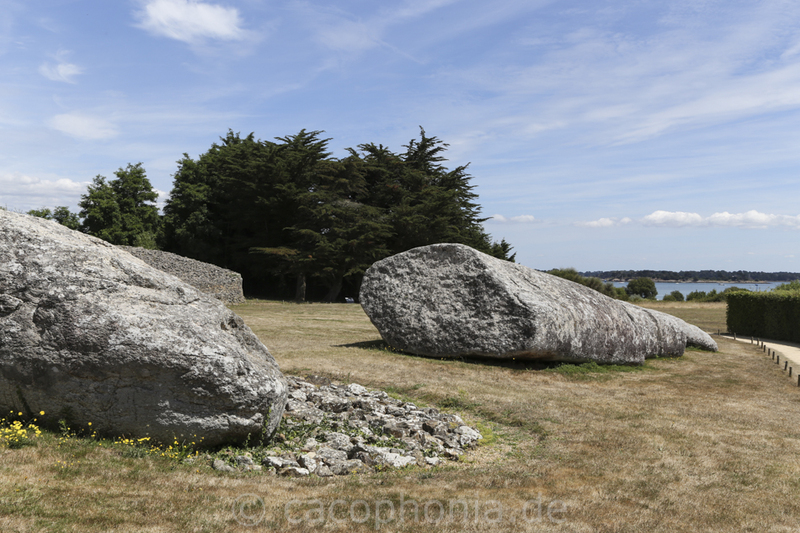 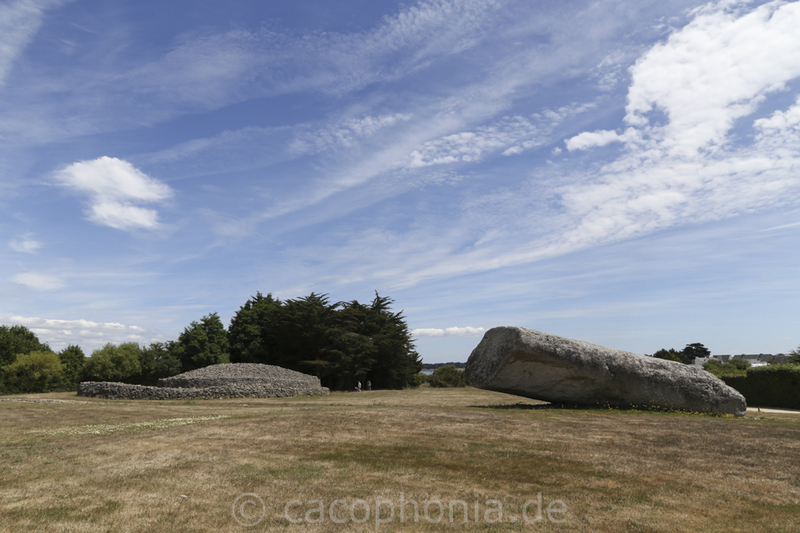 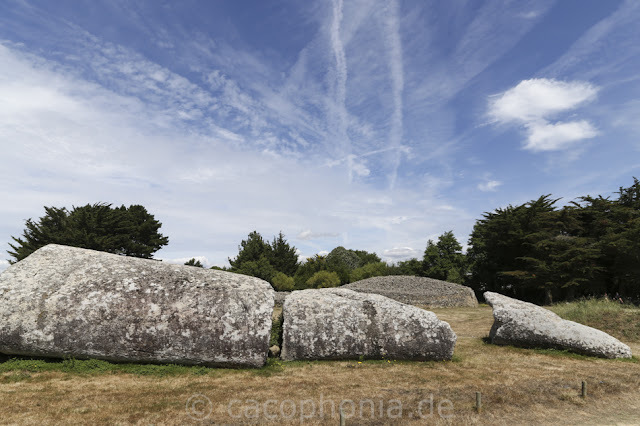 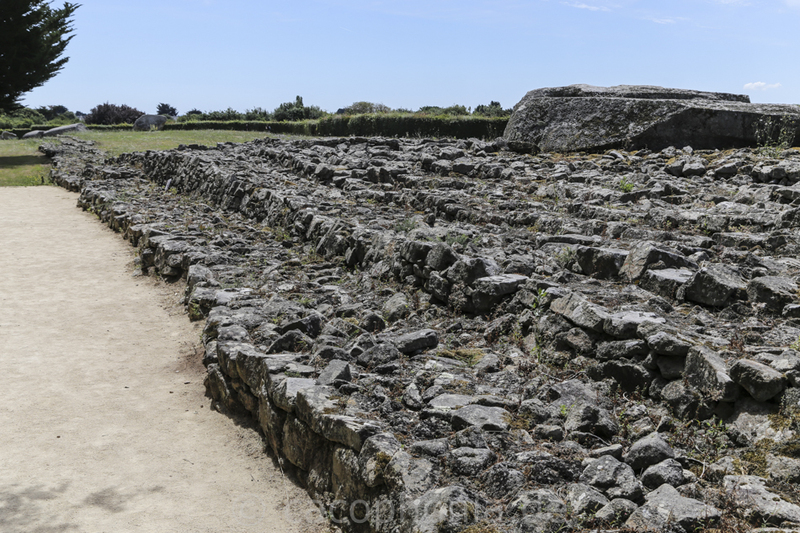 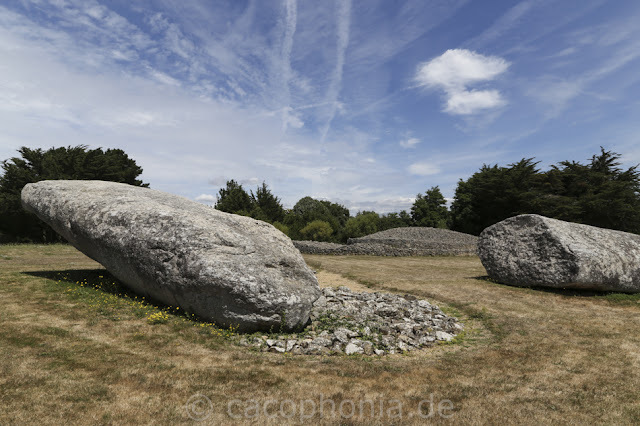 In Locmariaquer (Morbihan / Brittany) is a huge megalithic site with the Tumulus d'Er Grah, Table des Marchand and the broken Grand Menhir. 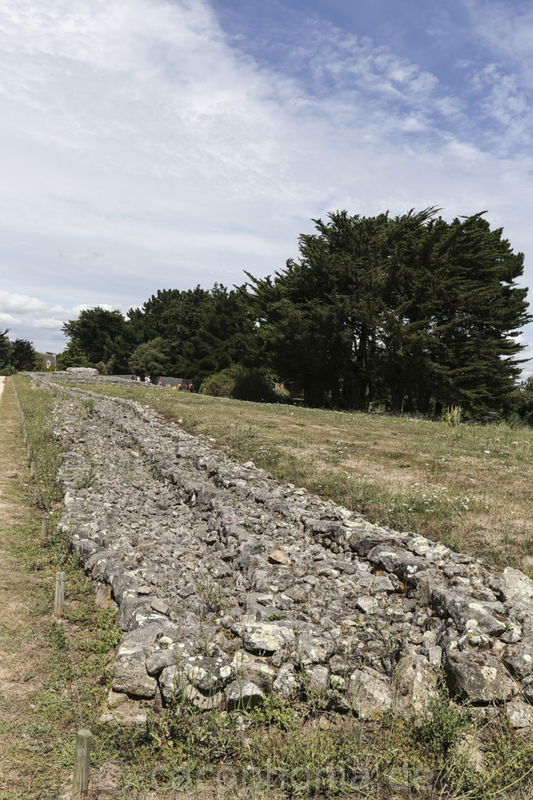 This area is well restored and organised. 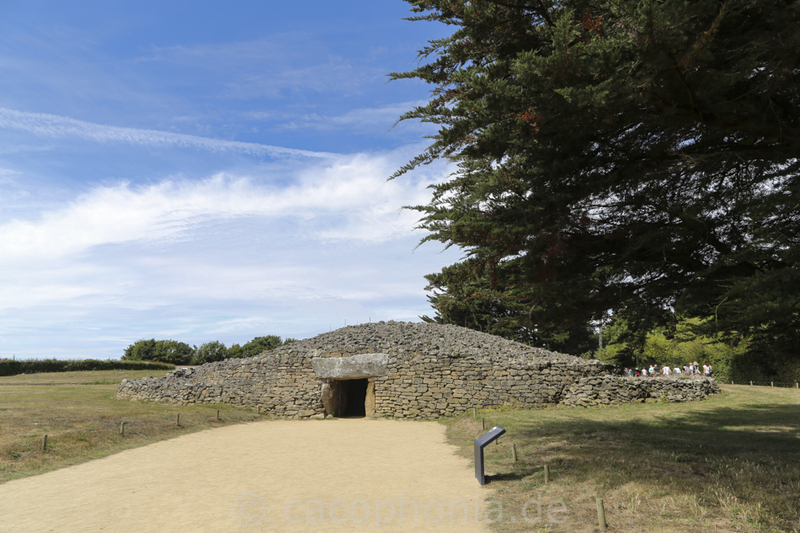 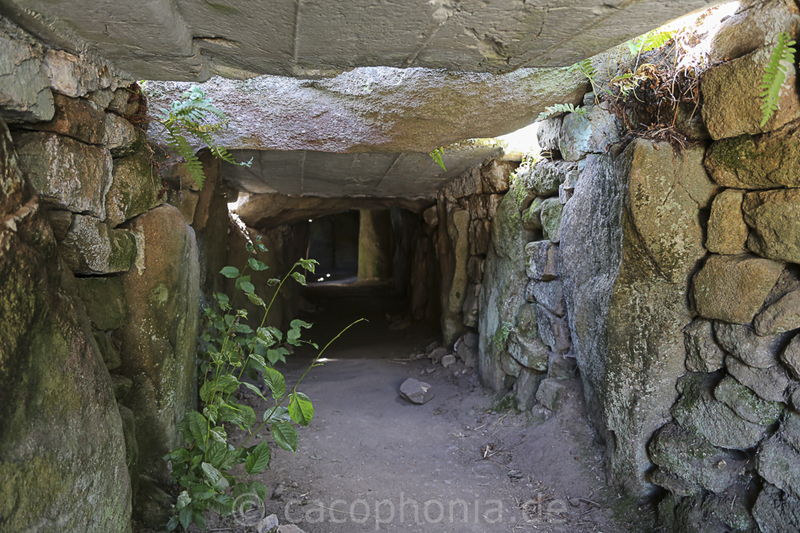 At the entrance you can watch an interesting movie about the neolithic age and its megaliths. 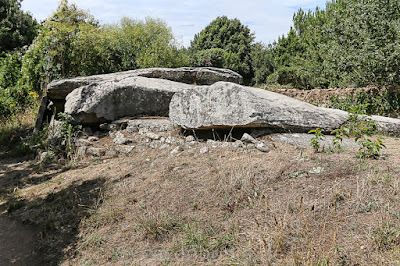 The Tumulus and Dolmen d'Er Grah (aka Er Vinglé) is one of a few closed single graves of the megalithic age. The Dolmen was built appr. 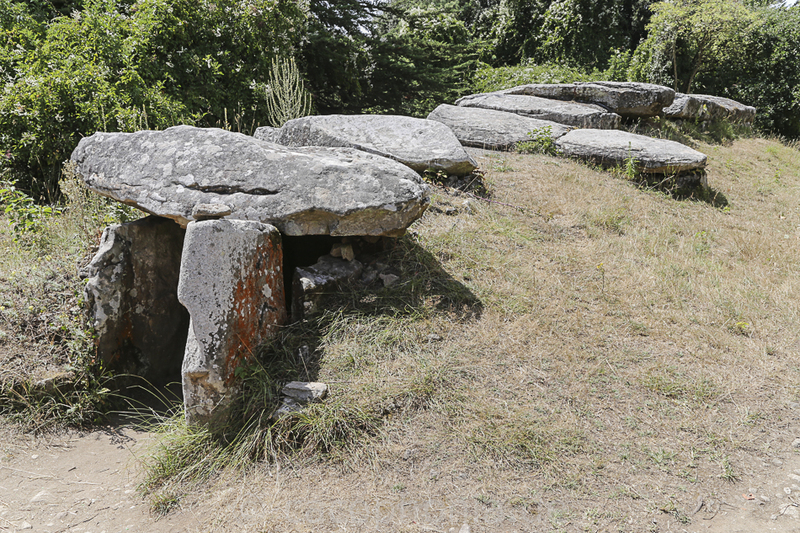 4200 BC. 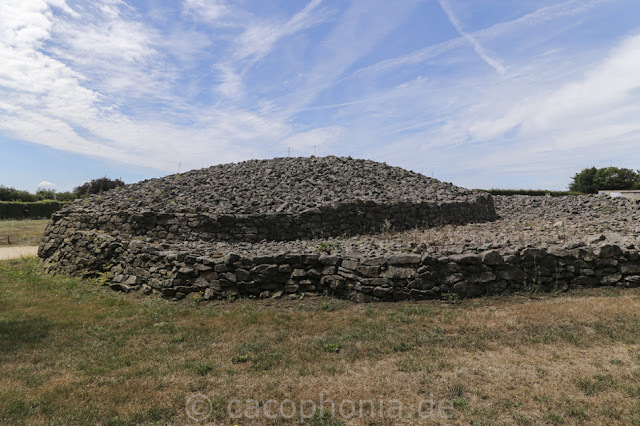 Its endstone is to be seen on the top of the Tumulus. 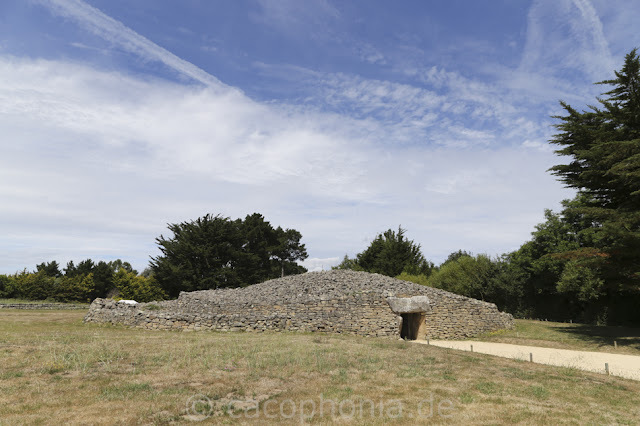 The Tumulus has a length of 140m and the width varies from 16m to 26m. 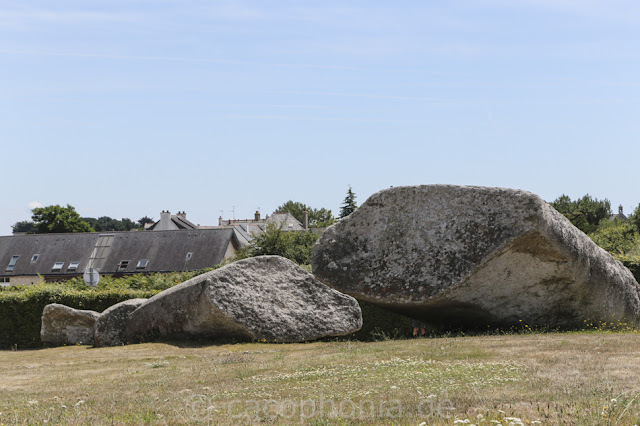 It must been one of the hugest in Brittany. 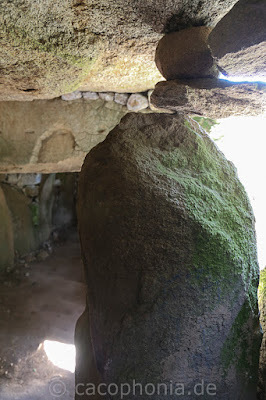 The stones are from local granite and orthogneiss was used for the endstone. This sight (aka An Daol Varchant) was built appr. 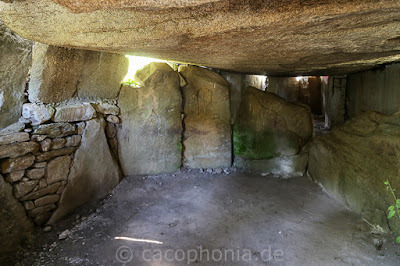 3900 BC. 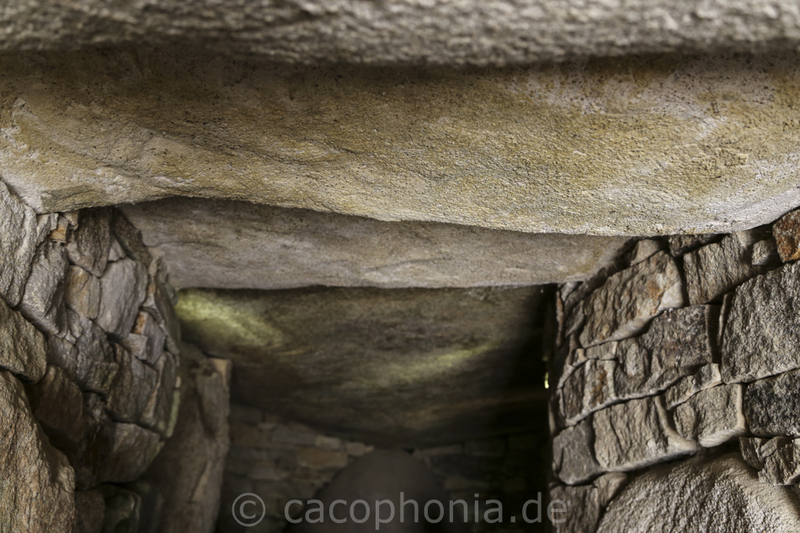 although the flag stone is older than the Dolmen. 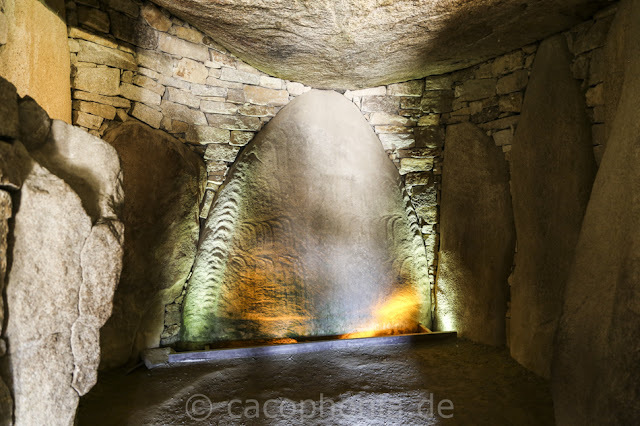 This stone with height of 3,20m has engravings on both sides. 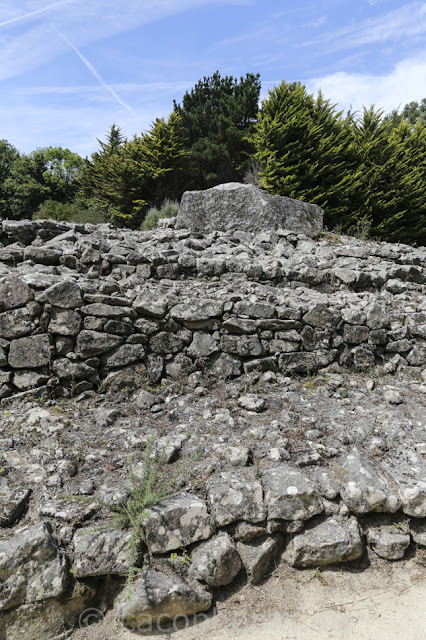 There are shown 49 crooks. 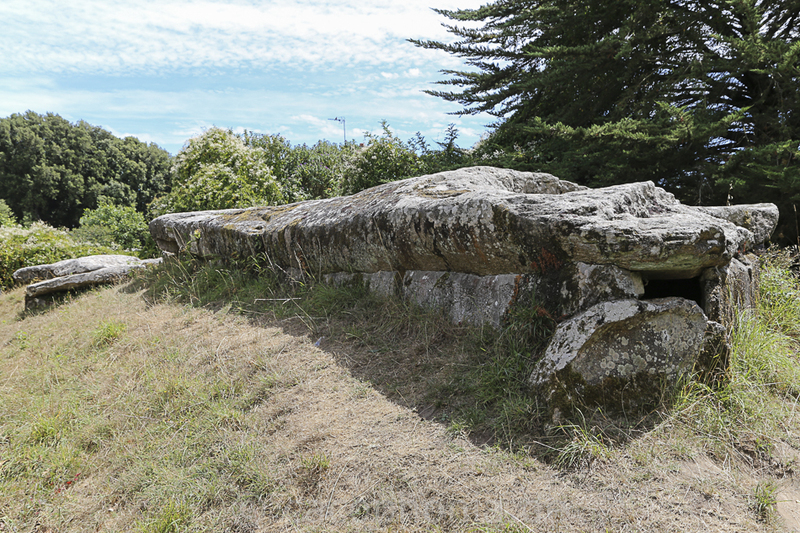 The capstone has engravings of a plough and the forelegs, breast and parts of the head of a cattle. Its horns seem to be engraved in another part of the capstone in Gavrini. 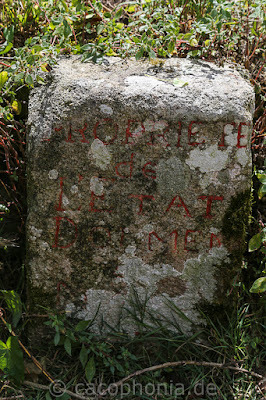 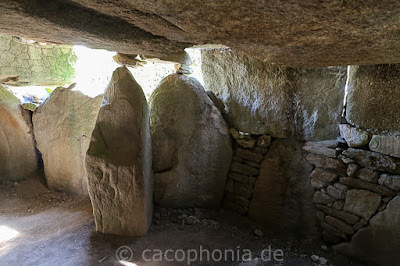 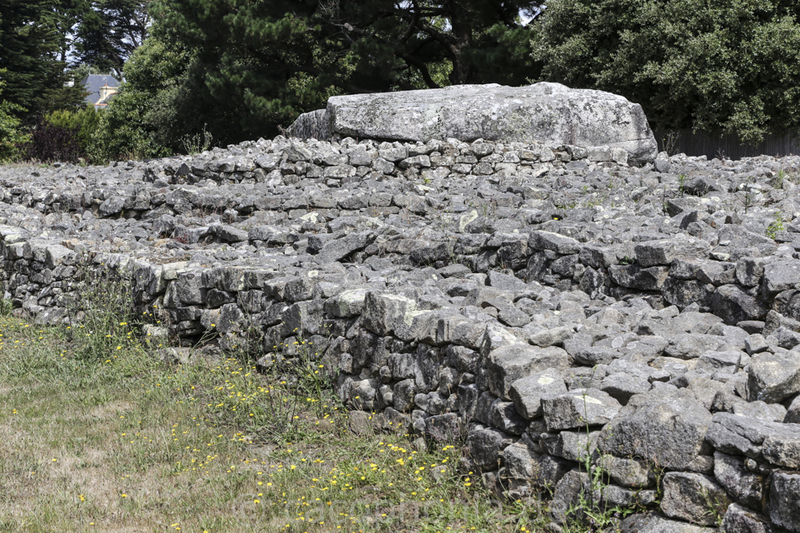 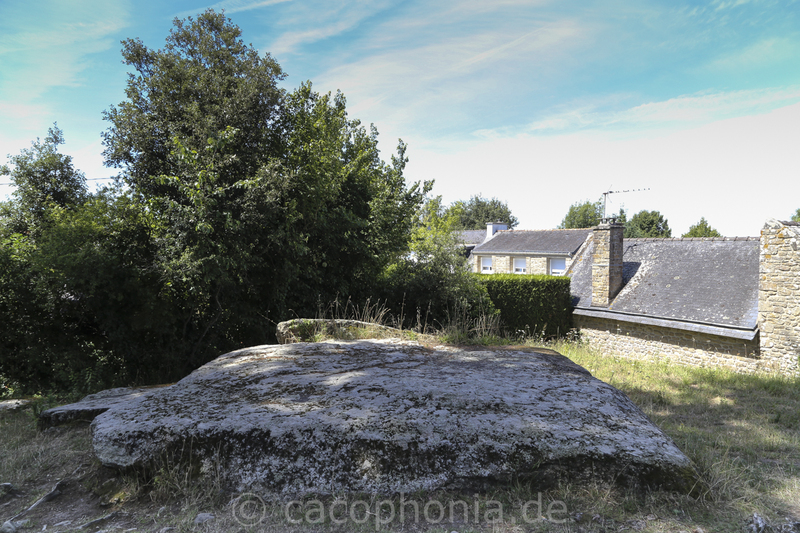 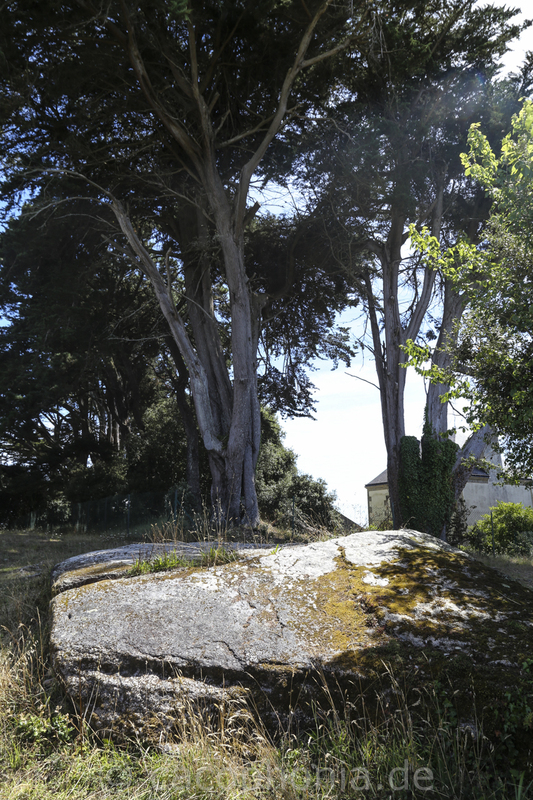 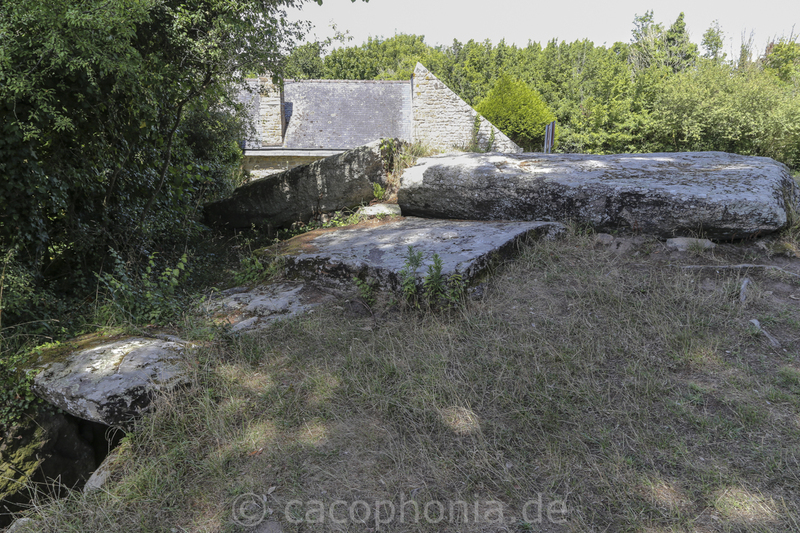 This stone in Locmariaquer is the lowest part of a menhir which middle part belongs to the Dolmen de Gavrini and the upper part is maybe the capstone of the Dolmen d'Er Grah. During an extensive reconstruction the Tumulus and the double-stage cairn were rebuilt. Beside the Table des Marchand four fragments of the Grand Menhir are situated and very well known as the world's biggest menhir. 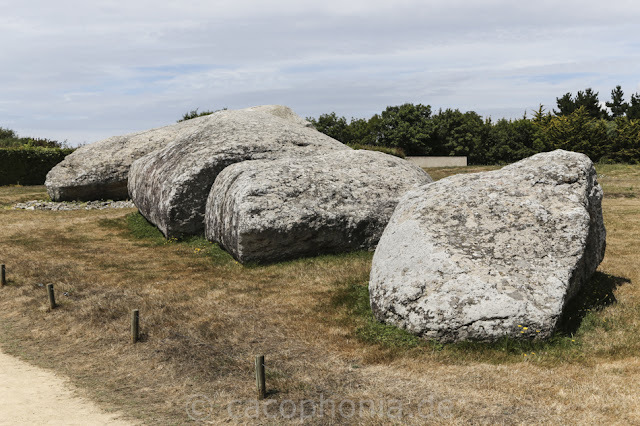 It is more than 20m long with a weight of 280 tons. 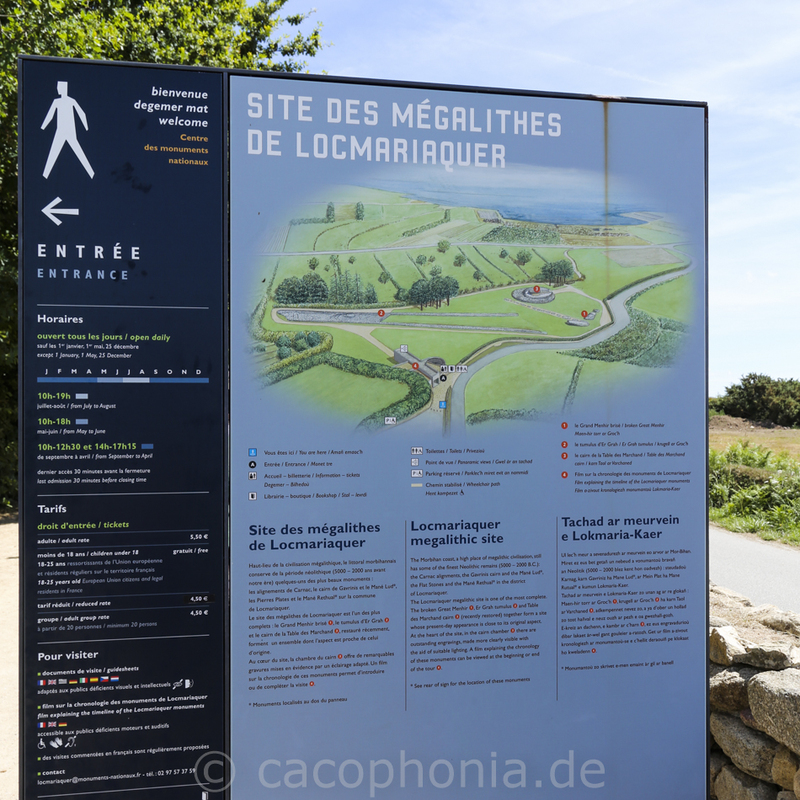 It consists of orthogneiss which is not to be found on the peninsula of Locmariaquer. Behind the Grand Menhir another 18 smaller menhirs had been standing in former times. 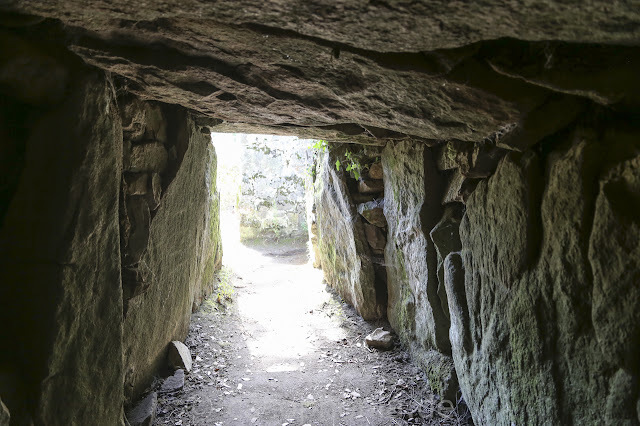 This alignment was built around 4500 BC and was destroyed between 4300 and 4200 BC. 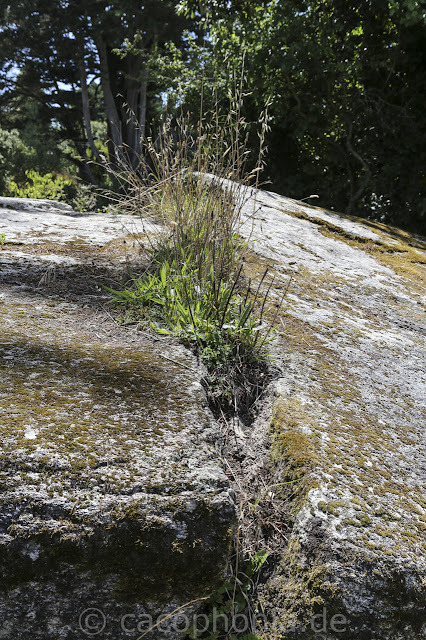 There is no hint on reason or initiator. 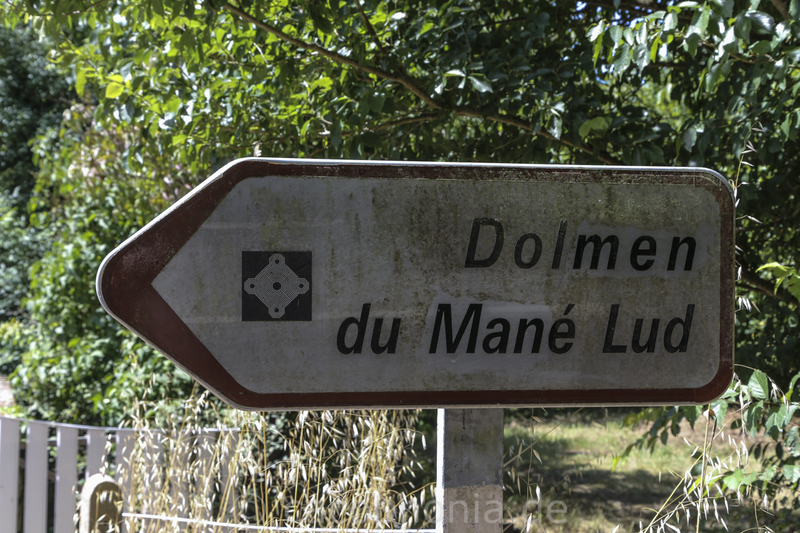 The Dolmen de Mané Lud is one of the biggest and most important megalithic monuments in Brittany. 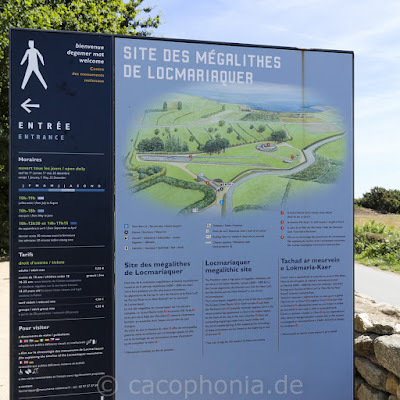 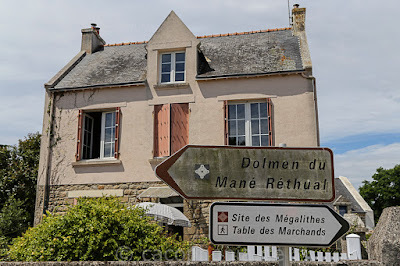 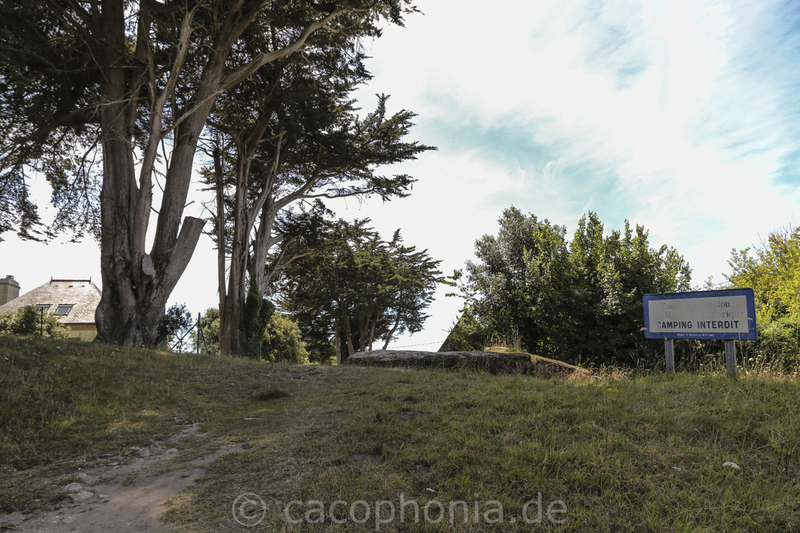 It is situated at the highest point in the peninsula in Locmariaquer - surrounded by trees and old houses in a nice and quiet area far away from tourism. Actually the Dolmen is part of a Tumulus of 80m length, 50m width and 5m height. 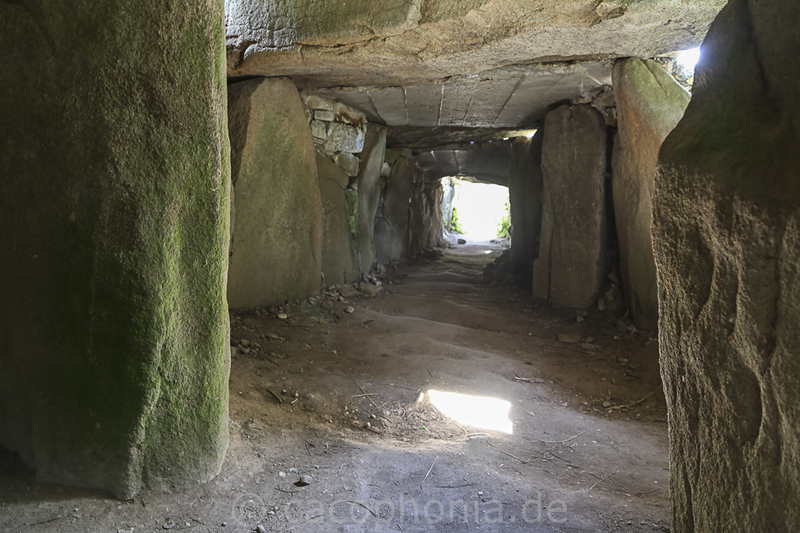 The corridor has a length of 10m but only 5m are covered with stones. 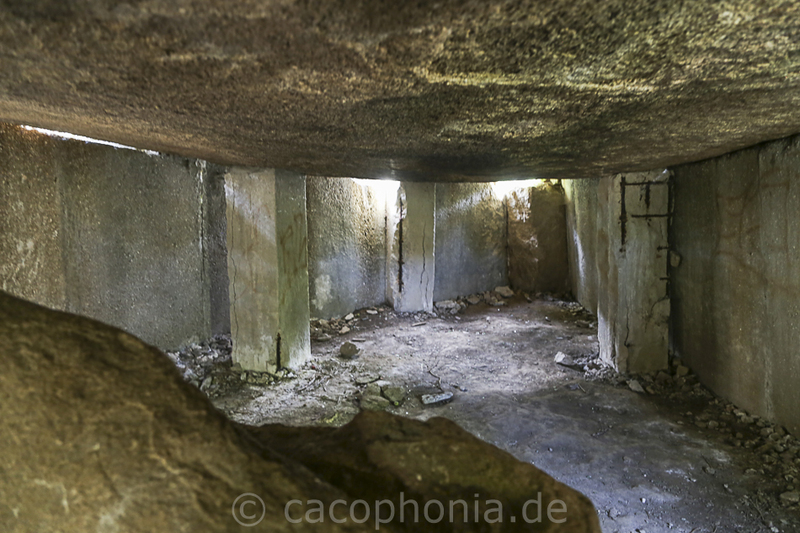 Dimensions of the chamber are 4m x 3m and a maximum height of 1,80m. 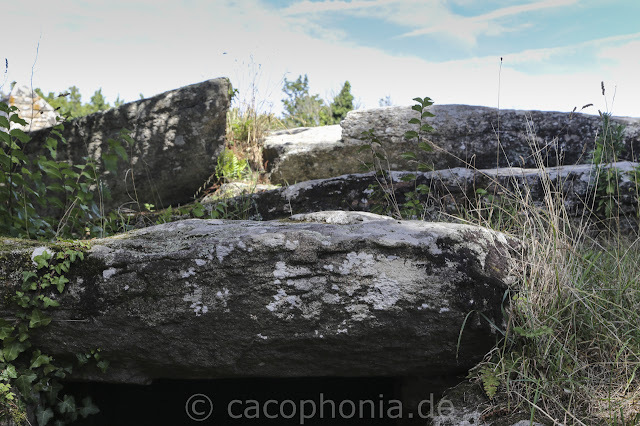 The capstone of the Dolmen has a length of 8,30m, width of 4m and height of 0,5m but it is broken in two pieces. 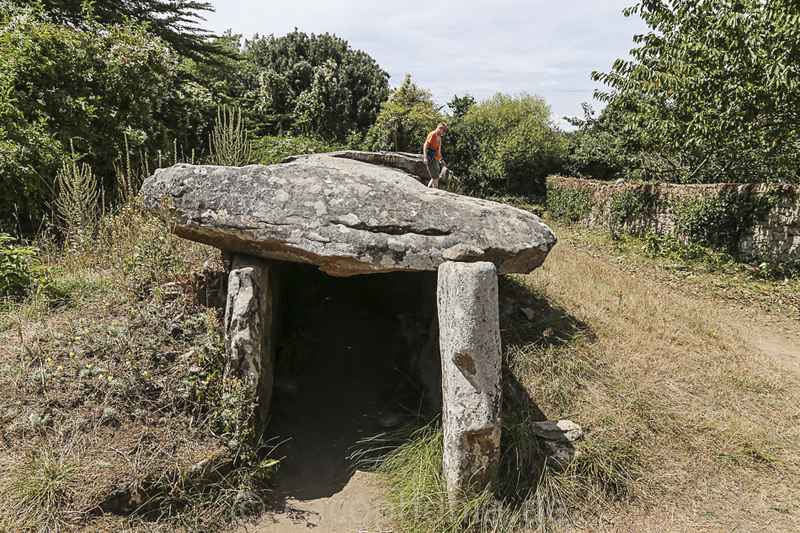 In the Dolmen skeletal remains of two humans, pottery sherds and flintstone were found. 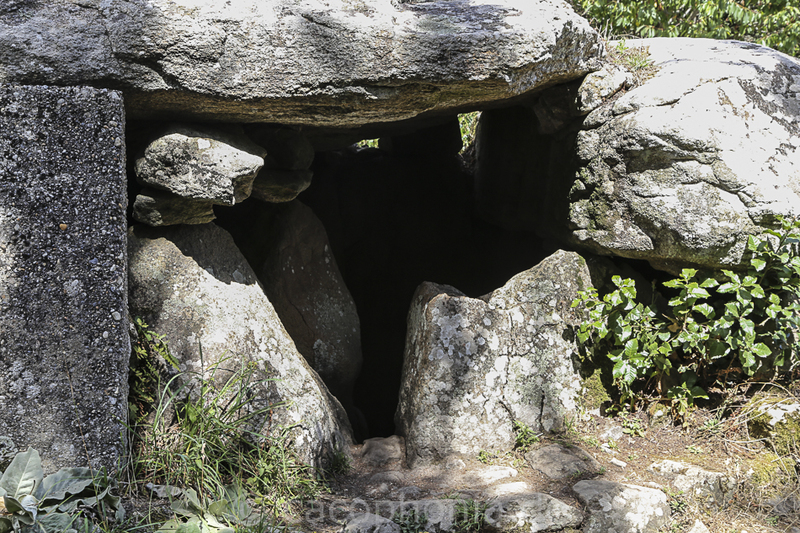 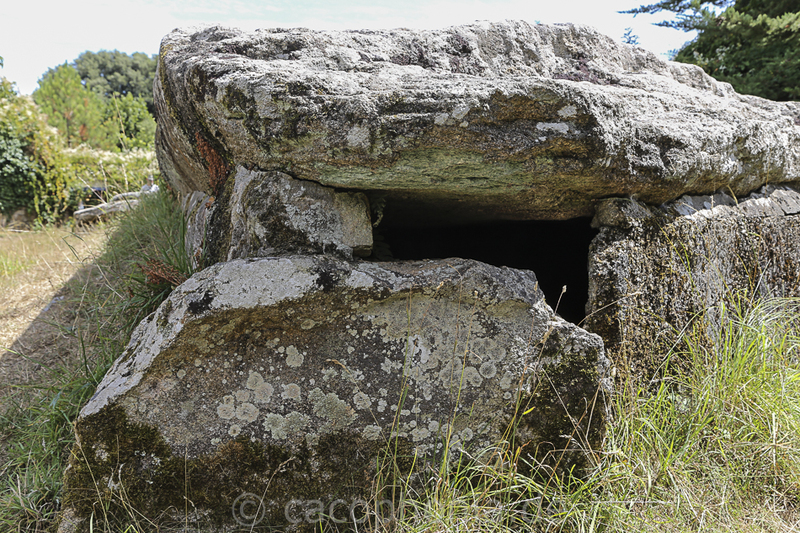 The very special in this Dolmen are several carvings in the end stones and the floor plate but not on the ones consisting from granite only from orthogneiss. They seem to show a whale blowing water (interpreted by Serge Cassen). 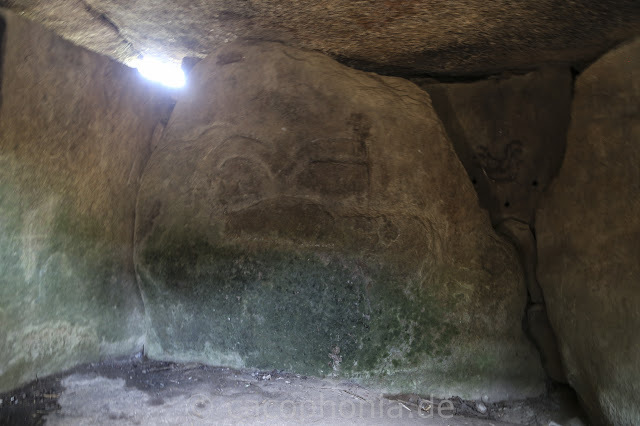 There are similar carvings at Gavrini. 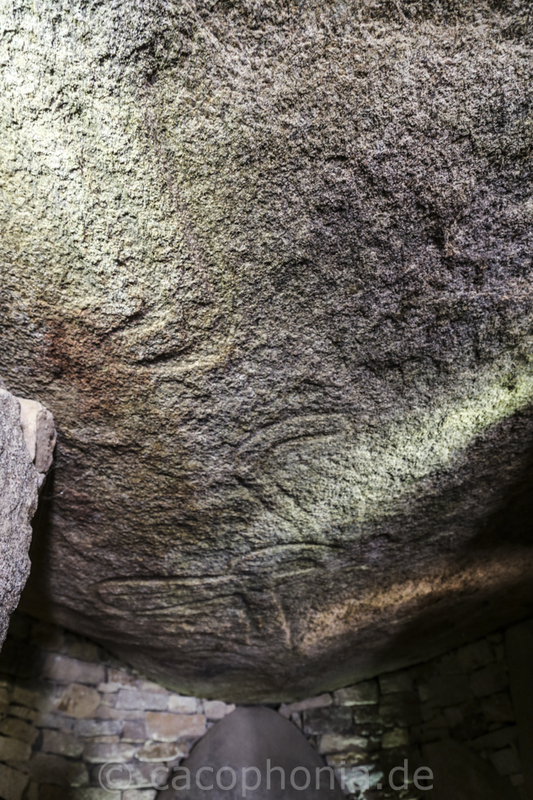 The smaler carvings look like Báculos (crooks).